Students whether learning online or at a traditional brick and mortar school often face some challenges along the way. With online learning, however, parents often struggle with exactly how to help their child. 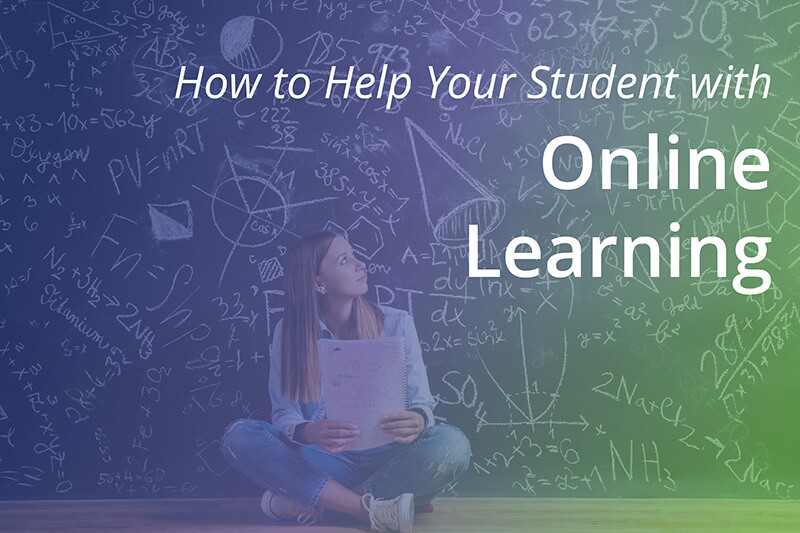 The truth is that there is not one fix-all for every family, but we’re here to give you a few guidelines and a bit of hope if you’re seeking a way to help your online learner. We’ve put together some suggestions on how parents can actively play a role in a student’s learning in an online environment. Some parents make a daily schedule for their child to help them stay on track. While other parents check in weekly with their child’s teachers. Whatever path you choose make sure that you consistently follow it the whole school year. It is very easy for struggling students to become inconsistent with their school work or to lose track of things, and the best example they have is you. Make a plan and then stick to it. It doesn’t have to be perfect or complicated, in fact, it should be simple and it should be a plan that both you and your student are confident you can both stick to. You are your child’s most important role model. Help your student understand the importance of consistently working and not waiting until the last minute. Procrastination is a dangerous habit to get into because it’s so difficult to change that habit. Find a way to be proactive about potentially more difficult assignments for your student. If they particularly struggle with science, help them stay on top of their assignments by encouraging them to get started right away and record their deadlines. Whether the boundary is homework before video games or 10 minutes of reading each night, enforce your rules and stick by them. Learning from home can have many built-in distractions, but helping your child stay focused by staying true to boundaries will help them tremendously. Teenagers still need their parents to help them through challenging situations. Try to guide your child through any struggles they may have by allowing them to express the way they’re feeling and ensuring them you’ll get through it. Just as important is to celebrate their successes. When you give them praise for their victories, they’ll want to repeat those achievements. Positive reinforcement is extremely powerful when a student is feeling overwhelmed. Many parents reach a point where they feel they need some assistance with helping their child with schoolwork. Don’t shy away from seeking outside help when needed, sometimes it is the best way to help. BlueSky Online teachers are here to help. Most of their day is spent providing one-on-one tutoring instruction to students who need assistance. Encourage your child to reach out to their teachers if they need additional help. Whether in a brick and mortar classroom or online, parents play a major role in their child’s learning success. Use these tips to help you find the balance that works for your family.